When people say "The Middle Ages" they usually mean the time period from when the Romans left Britain, to when the Tudors came to power (or perhaps to when Christopher Columbus discovered America, which was about the same time). These funny and educational poems about people and events from the middle ages make excellent bedtime stories for young children, or fun poems for older children. You will know some of the stories, but here, for the first time, they are told in the form of story poems for kids. Learn who the vikings were and what they did. Find out about Eric the Red, Lief the Lucky, Odin, Thor, and Ragnar Harybreeches. A poem about Lady Godiva's famous ride, naked, on horseback, around the streets of Coventry. The viking king Canute (or Cnut) is remembered for his doomed attempt to stop the tide from coming in. The Middle Ages are often called "The Dark Ages" because we do not know much about what happened then. There was very little written down at the time. 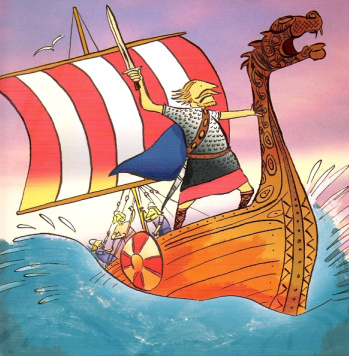 In the early middle ages, Vikings attacked Britain from the north. Eventually they triumphed, and England had a Viking king. In the later middle ages, the French invaded Britain from the South. They were victorious, and for a while Britain was ruled by a Frenchman - William the Conqueror. Jesters entertained the nobility in the castles, telling stories, doing tricks, playing music, and imitating bird songs. This was the age of the knight in armour. At first knights were just rich bullies, but after a while they started behaving like gentlemen. They fought duels and treated their enemies (and the ladies) with respect. European armies set off to capture Jerusalem on behalf of the church. These expeditions are known as Crusades. Eventually the Crusaders were driven out, and they returned back home. The Black Death killed millions of people in Europe. The English and the French fought The Hundred Years War (which actually lasted for 116 years). The weather turned very cold. The "Little Ice Age" lasted until 1700. This made growing food difficult, and lots of people were hungry. The English fought among themselves over who was going to be king. "The Wars of the Roses" were eventually won by the Tudor family. Henry Tudor took the crown from Richard III at the Battle of Bosworth Field.